I have to confess, when I first saw this CD my heart sank; a disc of First World War Songs seemed a rather too hackneyed prospect. But this new disc from Robin Tritschler and Malcolm Martineau on Signum Classics is definitely one to gladden the heart. 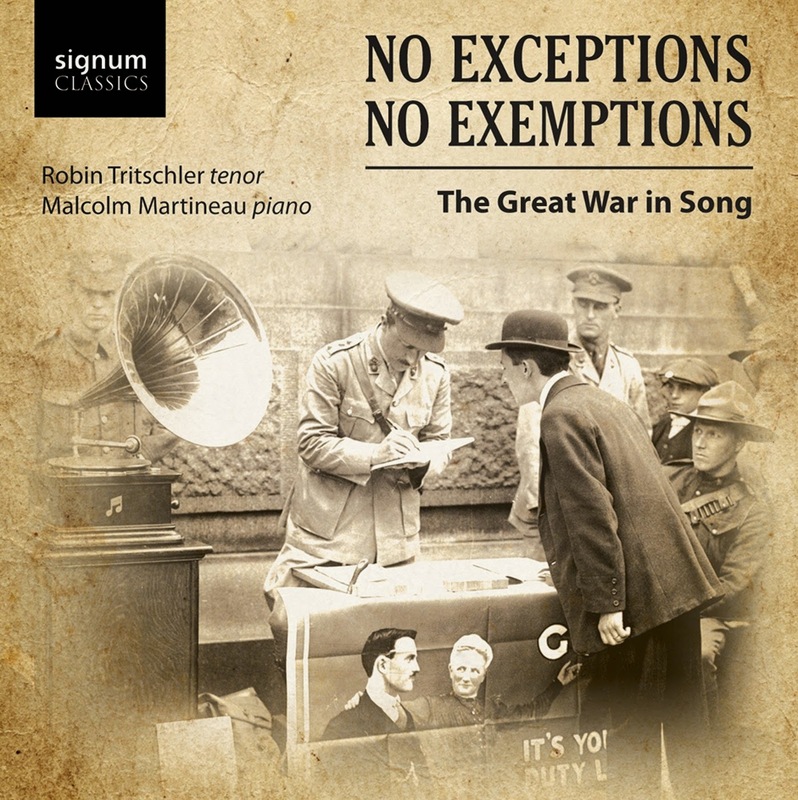 Tritschler and Martineau devote their recital to composers who took part in the First World War. The result is a remarkable programme which combines the known and the unknown in highly seductive performances. The songs are rarely about war directly, instead we have a varied sequence of side tangents full of joy, desire and melancholy. The list of composers makes remarkable reading, Alberic Magnard, George Butterworth, Sergei Prokofief, Frederick Delius, Rudi Stephan, Cecil Coles, Ernest Farrar, Darius Milhaud, William Denis Browne, Frederick Kelly, Frederick Keel, Edgar Bainton, Benjamin Dale, Claude Debussy, Michael Head, Albert Roussel, Piere Vallanes, Arthur Bliss, Ivor Gurney, Andrew Caplet and Charles Ives. The first disc, At the Front, covers composers who were actually fighting in the trenches which means that of the 10 composers, 7 died during the war. The selection includes composers from all major combattants British composers, plus Frenchmen like Alberic Magnard who died whilst defending his property from the Germans and Rudi Stephen, a German who was killed by a Russian sniper on the Galician Front. The only exception is Prokofiev who seems to have endeavoured not to get involved! The songs are sung in an imaginative order so that Butterworth's glorious On the idle hill of summer is followed by Prokofiev's Trust me, Rudi Stephan's cycle Ich will dir singen ein Hohelied by Cecil Coles, and Milaud rubs shoulders with Ernest Farrar and William Denis Browne. Inevitably not all the composers all well known. Some have a very small output, but the work of Rudi Stephan was a major discovery for me. The second disc is divided into sections which cover those who participated but did not fight, iincluding those such as James Frederick Keel, Edgar Bainton and Benjamin Dale who were interned in Ruhleben Camp, those who were forced to stay at home such as Debussy and Michael Head, and those who did return albeit changed such as Arthur Bliss, Ivor Gurney and Andre Caplet. And tt isn't only composers who died in the war, there were librettists too such as Francis Ledwige, whose poems were set by Michael Head. Assembling a recital like this, it would have been fatally easy to give us an almost exclusive diet of music by doomed English youth, a sort of echo of Lambert's 'cow-pat' school but instead Tritschler and Martineau show that the songs are richer and that the influences of continental composers can be detected in the English ones. As well full texts and translations, the CD booklet includes a long and informative article by Robin Tritschler which introduces the composers and the works and the way they fit into the First World War. Partly, the recital works so well because Tritschler and Martineau perform the songs so beautifully. Tritschler finds a lovely wide range of colours in his voice, from the incisively dramatic to the highly seductive. He has a very beautiful voice, but certainly does not coast through quite the opposite in fact. Throughout Tritschler is accompanied by Martineau in a stylish manner, in fact he is more of a partner. If you are looking for an interesting musical insight into the First World War then this is for you. But it is also a fine recital from a pair of talented artists.